Books are the gateway into worlds unreachable by other means. Within their pages, the darkness of our minds breaks through the cloudy veil of our restrictive lives to take us far and away. By now everyone has heard of the horrific mass shooting that occurred at the Pulse Nightclub in Orlando, Florida. The tragic instance of senseless violence is unfathomable at best as many of us wonder what would drive an individual to carry out such pain and devastation among innocent people and their loved ones. Throughout the day, social media and the national news outlets have glorified the incident, gathering ratings by feeding off the banter that draws readers and viewers to their sites. News is released as it becomes available, yet most of the action occurs in comments and side discussions that attempt to delve into the motive of Omar Mateen. At this point, all we know is that Omar Mateen harbored malicious thoughts toward the gay community. As such, he chose to visit the Pulse Nightclub and inflict motivated pain upon the attendees. Each individual that was present at the club, whether guest or employee, had their own reasons to be there. None expected their night to be disrupted by tragedy. None expected it to be their last night on Earth. Yet, rather than mourn their pain, suffering, and death, we choose to focus on the dead gunman, Omar Mateen. We attempt to find our way into his mind and look for motive. We attempt to use his hatred as a means to perpetuate our own agendas, whether political or conspiratorial. Scrolling through Facebook and Twitter, two common types of finger pointing are evident. The first being that Omar Mateen celebrated his Mulsim faith and the second being that he carried substantial firepower with him. As such, hatred against Muslims and denouncement of the Second Amendment are ripe across social media. As we view the case and new information is released about Omar Mateen, his past investigation by the FBI, and the motive that finally made him snap and commit the atrocity, a couple thoughts should stay at the forefront of our minds. For starters, we must fight the urge to jump to conclusions and force blame upon those that are innocent. Using his Muslim faith as a reason for the mass shooting is preposterous. Omar Mateen was Muslim by choice, but he was also Muslim as an individual. Omar Mateen was not representative of the Muslim religion as a whole. Blame against his faith is a prime example of the lack of open mindedness as the human race regarding religion as a whole. We choose to classify the worst of the worst within the religion as a representation of that religion as a whole. As we browse the media we do not see the positive that happens, but instead have the negativity thrust down our throats until we choke on the hatred and sadness. Yes, there are bad Muslims. Yet, there are bad Catholics, Jews, Buddhists, Islamist, and more. Yet we do not claim that the horrendous acts of John Wayne Gayce were caused by his Catholic faith, we just accept that he was a bad person. Omar Mateen may have claimed he enacted the murderous rampage on behalf of his faith, but he was not speaking on behalf of his faith. Instead, he was doing so in his own terms and for a very specific sect of his faith that attempts to use religion as an excuse to excuse the violence. We could equate that sect to the likes of the Westboro Baptist Church, a sect that claims to have God's best intentions in mind, yet uses their faith to spread hatred toward those with differing beliefs. It is funny how we do not classify the actions of the Westboro Baptist Church as being representative of the entire faith. Why would we do the same for Isis? In addition, blaming guns for the tragedy has become another favorite of the media as they rile up those against the second amendment and hope for others to join the cause. Let's be clear, the guns were simply the weapon of choice. If guns were illegal, Omar Mateen would have simply bought them from a guy in an alley. If guns were non-existent, homemade bombs, knives, or even rocks, could have been the weapons of choice. Some may say that the guns allowed Omar Mateen to kill multiple people in a short amount of time. The argument could be made that strategically placed pipe bombs would have done the same. Random stabbings as he meandered through the crowd could easily have killed many in a short amount of time. Ramming his car through the front door would have caused massive damage. Even injecting poison into the taps at the bar would have created unfathomable devastation. The point is, guns did not cause the violence. Omar Mateen's hatred caused the violence and devastation. As such, that is what our focus should be as we grieve for the wounded, the fallen, and their families. So, what caused Omar Mateen's hatred to boil over and wreak havoc in the popular nightclub? Was it his narrow minded view of the LGBTQ community? Was he ashamed of his own sexuality? Did he simply choose the club because it was packed and his devastation was bound to result in mass amounts of death? We may never know for sure. But what we did know is that something set him off and we are laying blame on religion and guns, while others are blaming homosexuality for coercing him to commit such acts. The entire incident is sickening, from the motive, the pointing of fingers at his weapon of choice and chosen religion, as well as those demeaning the dead and wounded because of their sexual preference. We are living in the year 2016. Why is an individual's sexuality any reason to inflict violence? Why are weapons being blamed for an individual's actions? Why is religion relevant in regard's to the misdeeds an individual carries out? We should be celebrating equality. We should teach the difference between right and wrong. We should welcome diversity. We should teach all religions and allow individuals to make their own choices regarding what they believe. But most importantly, we should hold our loved ones close, reacquaint ourselves, and be invest ourselves into their lives. If we did this, maybe...just maybe, we can prevent these incidents by recognizing the warning signs and get them the help they need before they snap and inflict more senseless violence. Of course, these are just my observations on the topic. However, rather than passing blame, let's open the discussion and help each other through this troubling time, rather than perpetuate the hatred that incidents like this seem to spew forth. If you would like to help the victims and their families, please visit the GoFundMe that has been set up to assist. Essel Pratt is the author of Final Reverie and ABC's of Zombie Friendship. Inspired by C.S. Lewis, Clive Barker, Stephen King, Harper Lee, William Golding, and many more, Essel doesn't restrain his writings to straight horror. His first Novel, Final Reverie is more Fantasy/Adventure, but does include elements of Horror. His first zombie book, The ABC's of Zombie Friendship, attacks the zombie genre from an alternate perspective. Future books, that are in progress and yet to be imagined, will explore the blurred boundaries of horror within its competing genres, mixing the elements into a literary stew. Blade of the Destroyer, by Andy Peloquin and published by J. Ellington Ashton Press, released on August 21st and is sure to turn any reader into an instant Peloquin fan! "A faceless, nameless assassin. A forgotten past. The Hunter of Voramis--a killer devoid of morals, or something else altogether? (Blade of the Destroyer--dark fantasy with a look at the underside of human nature)"
Not surprisingly, Blade of the Destroyer released in the top spots of Amazon's ratings and has already garnered 25 reviews with an average 4.6 out of 5 stars! Many have stated that Blade of the Destroyer is a wild ride from start to finish, and I agree 100%. When I started reading, based on the description of the book, I am not sure what I expected. Yet, I knew there would be mystery and suspense within the pages. Not only did Peloquin not disappoint, be he blew me away! When I finished, I was left wanting more, then I realized, this is only book one! 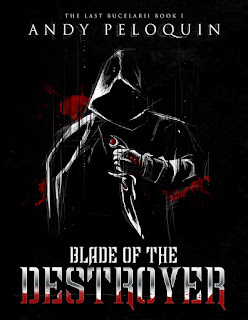 If you are not sure about Blade of the Destroyer, give it a chance, it will blow you away! "The Hunter of Voramis is the perfect assassin: ruthless, unrelenting, immortal. Yet he is haunted by lost memories, bonded to a cursed dagger that feeds him power yet denies him peace of mind. Within him rages an unquenchable need for blood and death. When he accepts a contract to avenge the stolen innocence of a girl, the Hunter becomes the prey. The death of a seemingly random target sends him hurtling toward destruction, yet could his path also lead to the truth of his buried past?" Don't forget to join in the Facebook Book launch for fantastic prizes! Essel Pratt. Awesome Inc. theme. Powered by Blogger.